Small & Big Jobs No Problem! Griffith Handyman is your local handyman service company in NJ, specializing in all of your commercial and residential construction needs. We are proudly locally owned and operated since 1999. We are your local repair and remodeling Handyman who serves all towns in Morris, Passaic, Essex, Bergen, Hudson, Sussex and Union Counties in New Jersey. Griffith Handyman, Inc. is an owner- operated company, that does not have to pay a franchise fee. This allows us to keep our handyman rates to be competitive and cost efficient for home and business owners. Griffith Handyman, Inc. your local handyman service company in NJ specializes in carpentry repair, concrete/masonry repair, painting, sheetrock & drywall repair, tile repair, tile re-grouting, deck repair, door/lock repair & replacement, re-caulking of doors-window-tubs, power washing, gutter cleaning, carpet cleaning and many other handyman and remodeling services in New Jersey. At Griffith Handyman, Inc., We strive to continually improve our service by keeping up with the latest changes in construction repairs and remodeling industry as well as carpet cleaning systems, carpet cleaning chemicals, and many more service options. 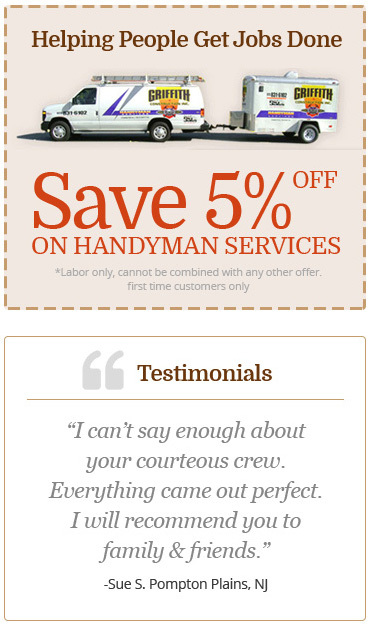 Call us at (973)831-6102 to discover the Griffith Handyman difference for North NJ.